Neuschwanstein is Germany’s most famous castle. Americans may know it as the Cinderella Castle seen at Disney World. It was inspired by this King Ludwig Castle! Should You Visit Schloss Neuschwanstein Alone or with a Tour Group? Which Castle Tour Should You Do? Is it Worth Visiting Schloss Hohenschwangau As Well? It is my hope that you truly enjoy your visit to Schloss Neuschwanstein and that these tips will make your visit a fairytale one! Remember, the easiest and most relaxing way to visit Neuschwanstein is with a tour. Part of the charm of this 19th century Romanesque Revival Castle is its location. Situated high on a rocky outcrop overlooking the village of Hohenschwangau at the foot of the German Alps in Bavaria, it’s just breathtaking! King Ludwig II was…creative…eccentric…some would even say mad. More on that later! You’ll get a glimpse inside of how his unusual mind worked when you tour the castle. Designed in a mix of Roman, Gothic, and Byzantine styles, all randomly blended. Highly stylistic, it pays homage to the German composer Richard Wagner. 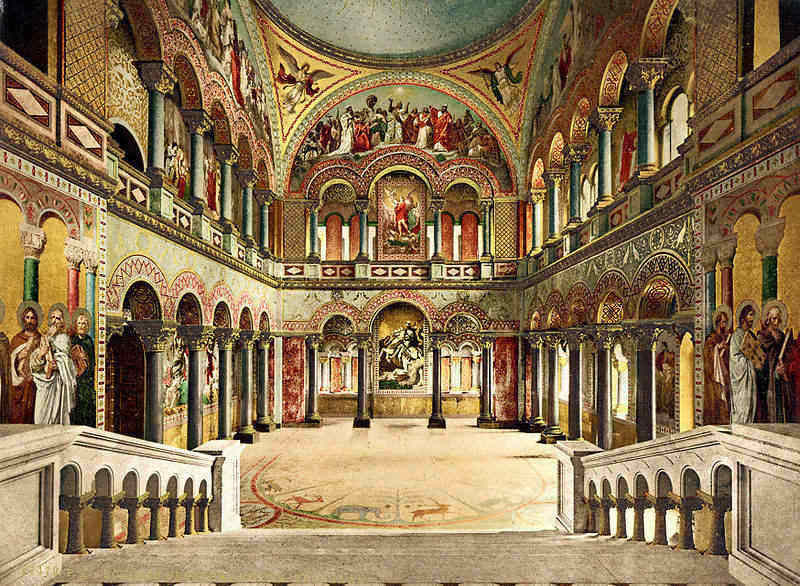 But his taste didn’t come cheap, and with just 15 of the 200 rooms complete, King Ludwig II found himself 14 million German marks (~$8 million U.S.) in debt. He was deemed incapacitated to rule. And he died under mysterious circumstances in the shallow waters of Lake Starnberg. Despite the fact that he was an excellent swimmer. But I digress. Here’s where it gets ironic. Neuschwanstein Castle was a financial burden to King Ludwig. However, it became an incredibly lucrative source of income for the House of Wittelsbach rulers. It opened to visitors just seven weeks after his death. Also ironic is that the castle was the king’s private retreat. Today it’s visited by 1.3 million people each year! Its popularity is in part makes Schloss Neuschwanstein one of my least favourite castles in Germany. Having said that, you’re probably going to want still to go. I completely understand. It’s by far the most popular castle in Bavaria. The best views of the castle are not at the castle itself but from Marienbrucke. Mary’s Bridge in English. The bridge crosses the Pollät gorge and offers fantastic views of Neuschwanstein! It’s about a 30-minute uphill walk from Hohenschwangau. For an even better view, climb just past the bridge for a different perspective. – Getting there: You will need to have a car to get here or take the shuttle offered by the hotel for a fee. This isn’t just any castle, it’s a 1000-year-old castle! Situated in the foothills of the Bavarian Alps and surrounded by parkland, it’s a gorgeous, peaceful setting. The rooms are quaint (i.e. small by American standards) but offer distinctive touches such as 4-poster beds, oak floors, chandeliers, balconies, and antique furniture. Ask for a view overlooking the park or the courtyard. Guests have access to the museum and concerts that are open to the public. It’s easiest to drive if you want to explore the area, but an airport shuttle is available for a fee. Alte Postvilla (old post office villas) offers apartments in the former post office which is now a landmark! It’s a great option for families looking for extra space. Fresh bread and a newspaper are hand-delivered right to your door each morning! It’s located right in Oberammergau, making it easy to walk and explore the town. While Hotel Rübezahl is not a castle, it does provide excellent views of both Neuschwanstein and Hohenschwangau castles – the next best thing to actually sleeping in a castle! It has a spa area (try the Kneipp area for a local treat) and a gourmet restaurant serving regional food and an elegant cozy atmosphere. Best of all, it’s location can’t be beat! 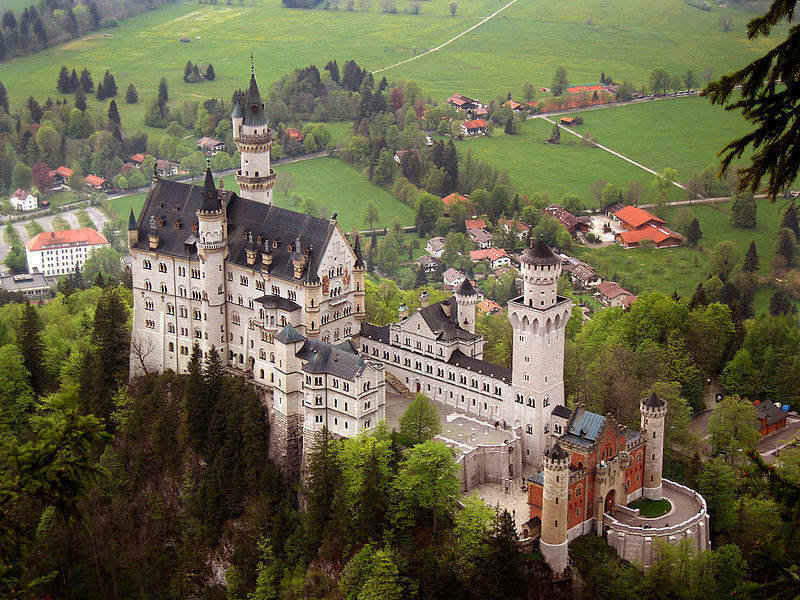 It can also arrange for entrance tickets for both the Neuschwanstein and Hohenschwangau castles upon request. The castle itself, you can only visit with a guided tour lasting 30 – 35 minutes. You may find yourself feeling rushed. You’ll be stuffed into each room with the other 60 or so other visitors on tour. Unfortunately, that’s your only option for visiting the castle. Tickets cost €12. It’s also worth noting that you aren’t allowed to take photographs once inside. I don’t say this to dissuade you from going, just to give you a realistic idea of what to expect.. I recommend going with a guide. The reason being that Neuschwanstein can receive up to 6000 visitors a day in peak season! In other words, it’s a madhouse. You must be organized and reserve tickets in advance. Otherwise, you risk waiting several hours, as I did. Even worse, you could arrive, and tickets could be sold out for the day. It’s also a lot to navigate if you don’t know where you’re going. The downside of purchasing your tickets in advance is that they’re only good for a particular time. You need to calculate enough time to get there. Then walk up to Neuschwanstein which takes ~ 30 minutes from Hohenschwangau. It takes a lot of planning to avoid waiting around for hours. In other words, too much planning when you want to be relaxing and enjoying your vacation in Germany. Should you decide to visit Neuschwanstein the easy way, I would recommend one of these tours. They include return transportation to Munich, so you don’t need to figure out to get there. Also, your guide will time everything correctly. You can rest assured that you’ll get to see Neuschwanstein. Without missing it because it’s sold out or because you’ve arrived past your ticket time. Another tour that I recommend is the day trip that includes a visit to both Neuschwanstein and Linderhof Castles. Schloss Linderhof is another King Ludwig II castle. While it’s small, for what it lacks in size, it makes up for in grandeur! It’s also the only finished castle of King Ludwig II. The grounds are also beautiful! My favourite part about Schloss Linderhof is the Venus Grotto. It’s an illuminated artificial cave made primarily to illustrate the first act of Richard Wagner’s Tannhaüser! I’ve never seen anything like it! Travel Tip: Unless you’re driving, being part of an organised tour would be the easiest way to visit both castles in one day. It would take a long time if you were doing it by public transportation. Perhaps you have decided you do want to do it on your own. The first recommended, but not a necessary step is to buy your castle ticket in advance. It’s available here. Note: At the time of writing there was an extra fee of €1.80 for each ticket purchased in advance. You catch your train at the München Hauptbahnhof, Munich’s main train station. The entire journey will take between 2:23 and 2:45, depending on which train and bus you catch. Your trip will be in two parts. First, a train from Munich to Füssen. Then a bus from Füssen to Hohenschwangau. Finally, a 30-minute walk up to the castle itself. The train leaves every 1:20 hours or so. Check the Deutsche Bahn train schedule to cut your wait time. Train reservations aren’t needed. You can buy your tickets at the ticket machine. It’s cheaper than buying them at the counter. That costs an extra €2. The ticket machines have an English language option. You’ll want to buy a Bayern Ticket. It allows you to travel the day anywhere in Bavaria. It costs €23 a person and €5 extra for each additional person. You can have a maximum of 5 people on one ticket. So if you are travelling as a group of 2, you would pay €28 for the entire day. The ticket is also valid for your return ticket if you come back the same day. Travel Tip: the Bayern Ticket is only valid after 9:00 am. Make sure your train leaves after 9:00 am. If you board a train that departs at 8:55, the Bayern ticket isn’t valid. While the train is comfortable enough to sleep, you definitely won’t want to. The route is a picturesque journey of mountain peaks and cows grazing in green meadows as you enter the Allgäu Alps. I’m convinced this region is home to some of the happiest cows on the planet! Once you’ve reached the Füssen train station, you have two options for buses. Take the one that comes first. Ride line RVA/OVG 73 in the direction of Steingaden / Garmisch-Partenkirchen. Alternatively, you can also take line RVA/OVG 78 in the direction of Schwangau. You’ll get off at the Hohenschwangau / Alpseestraße stop for either bus. Once you reach the village of Hohenschwangau, it’s about a 30-minute walk to the castle. If you’re travelling with your bags, there is luggage storage at Füssen station. It’s worth noting that if you need to buy your ticket, buy it before you start heading up to the castle! Tickets are only available at the Ticket Centre in Hohenschwangau, and not at the castle itself. If you plan to walk up to the castle, it takes about 30 minutes. We did it in 20, but hike in the Bavarian Alps every weekend. You’ll want to wear comfortable shoes. The path is steep in places, but paved. I saw people pushing baby carriages up. It’s doable but does look like a lot of work. You must leave your stroller outside and at your own risk while you do the castle tour. If you didn’t want to walk up you could go by horse and buggy. It costs €6 per person uphill and €3 per person downhill. Note: You still have to walk up 300 meters if you take this option. Your other option is to go by shuttle bus (which doesn’t run in snowy conditions). It costs €1.80 per person uphill, €1 per person for downhill or €2.60 for a return trip. This map shows you how to get there. Admittedly, I did not visit this castle, when I visited Neuschwanstein. However, I have plenty of friends that have who recommend it. You’re right there, and it’s completely different than Neuschwanstein. 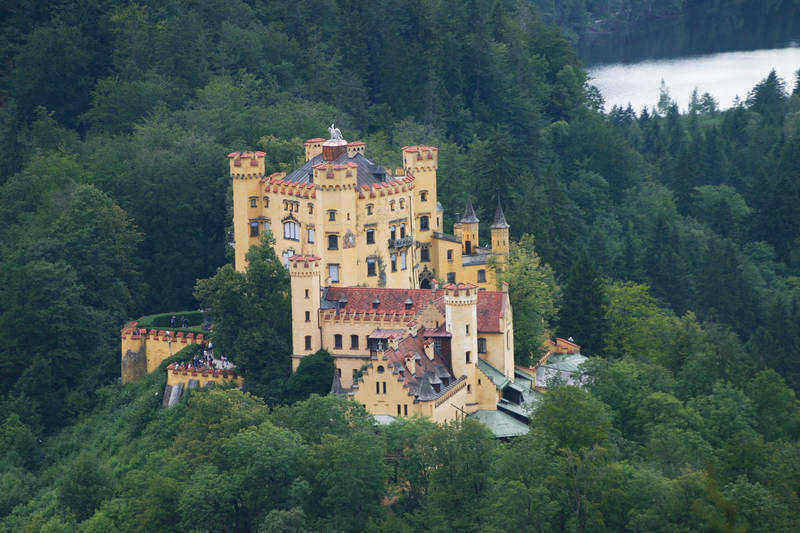 I plan to go back one day just to visit Schloss Hohenschwangau and regret not visiting it when I was there. If you decide to visit it, you can buy a combination ticket. You may also want to consider spending a night to really soak in the Allgäu atmosphere. Check out these hotels in the area. One final travel tip: When you’re in the village of Schwangau, stop and pick up some Bergkäse (mountain cheese). The cheese from the Allgäu is legendary. Happy cows make incredible cheese! Great post. My tip for visiting the Fairy Tale Castle Neuschwanstein is a visit in winter (if you have the chance to). It is cold inside, but there are only few people going there. When I was there in February we didn´t have a queue in front of us and were able to enjoy the castle pretty much for us alone. During summer visiting the Neuschwanstein Castle is a pain in the ... If you have time it´s a great idea visiting the nearby city Füssen. They have Schneebälle (snow balls) which are delicious and perfect if you are a sweet tooth. @Christina - Great tips! Thank you! Excellent article and tips! Thank you for sharing. Hey,Laurel. We have also not visited Hohenschwangau but after visiting Neuschwanstein I guess it would seem very boring. However, we heard there are other castles in Bavaria built by Ludwig II that we are eager to visit as well. @Rafael and Thomas, good point. Probably better to visit Hohenschwangau first. I'm a big fan of all of King Ludwig II's castles. They each offer something different. Great post! But I can't find out how to check the castle to make a reservation in English. Website won't link to English. any tips?